Missionary Support. What is it? In Romans 10:15, the apostle Paul identifies two important components of missions — those who “go” and those who “send.” Churches and missionaries are partners in missions, two halves of a team that God uses to extend his kingdom worldwide. They encourage one another, pray for each other, and share progress and challenges. Through their partnership, God is glorified and both parties are strengthened in their vision and mission. Resonate Global Mission has more than 200 international missionaries serving in over 40 countries, and through partnerships, our work extends to more than 50 countries. That includes full-time Resonate missionaries, as well as Partner Missionaries – CRC members who are employed by a variety of other ministry organizations. In the United States and Canada, we partner with 39 new churches, 10 of which started in the past year. We also support campus ministries at more than 35 college and university campuses. Resonate also partners with churches and individuals to send volunteers to serve alongside our full-time international missionaries. Last year, Resonate sent over 440 volunteers to serve all around the globe. The way individuals and churches give to ministry has changed. Rather than giving to a general fund where resources can be used where needed, preferences are trending toward specific causes. People are giving in such a way that they want to know where and how their gifts are used. Because of this “designated giving” trend, as well as a number of other factors, Resonate uses individualized budgets for our full-time Resonate missionaries. Current missionaries are partnered with churches and individuals to raise funds for their ministries. 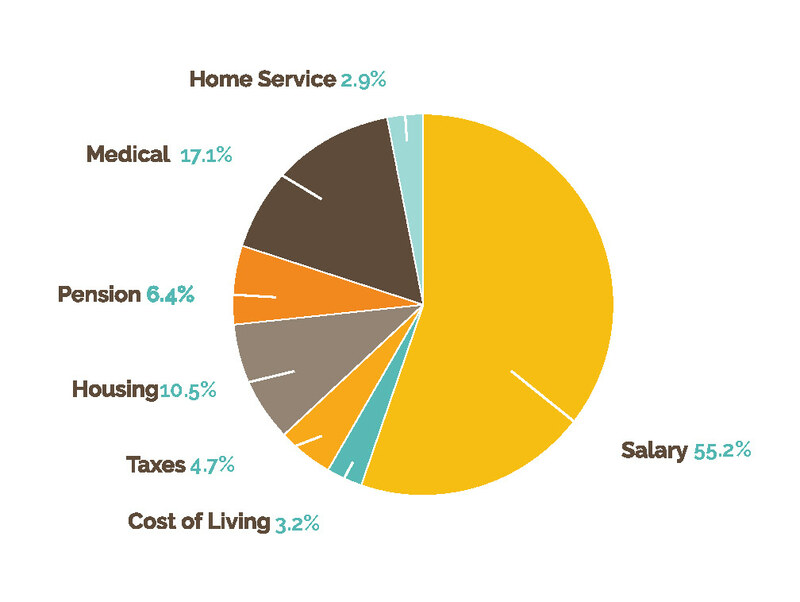 Budgets include salary, housing, home service housing and travel, medical insurance, and pension among other things (see pie chart). Administrative costs that cover support services are not part of individualized budgets. These costs, such as travel and logistics, pastoral care, processing of receipts and donations, prayer cards and resources, training and mentoring for ministry are covered by ministry shares, general offerings and gifts, and allocations on other incoming donations. New full-time Resonate missionaries will leave for the field once the first year of their individualized budget is raised. Pledges, as well as actual gifts, received count toward the fundraising total. This assures a solid financial foundation for the future, relieving future stress from significant support raising ministry. It also provides a network of individuals and churches who provide prayer, care, and encouragement through the mountains and valleys of missionary life. "Strong support means knowing they have my back, churches and donors are a known constant in a changing world. They help form the foundation. They are the lighthouse. I can count on them, and I don’t need to worry about them - sort of like family." To not only survive but thrive in cross-cultural ministry, missionaries need a strong support team – one that provides not only finances but also prayer and care. To be good senders, the people of God have a critical role in this Great Commission task. Missions is born out of healthy local churches. God has a heart for reaching people of all tongues, tribes, and nations. If our heart is where God’s is, then a passion for missions is easy to kindle. We may not all be called to go, but we all have a role in sending. If relationship is at the heart of missions, then prayer is its lifeblood. As global Christians, we carry our Bible in one hand and the news of the world in another. God uses prayer to open doors, provide safety, sustain during hardship, bring resources to bear, and soften hearts. Communication is the important vehicle that draws the entire relationship together. The missionary is expected to share prayer requests and praise reports with the churches and individuals so that prayer for the missionary is deep and rich. Likewise, the church is expected to share similar information with the missionary if the ministry is truly an extension of the church. By praying together for each other, the missionary and the churches and individuals supporting the ministry approach their heavenly Father with the same message. When such prayers are answered, they share the joy together, multiplying the effect of such petitions. Volunteer — Resonate offers short-term volunteer opportunities ranging from a few weeks to a year. Partner —Resonate sends partners to serve with schools and organizations that share a common vision for ministry. A Career — Resonate offers long-term opportunities to amplify God’s mission for his kingdom. Missions Advocate — Become the Resonate representative at your church. Resources — Use Resonate resources.